It spring once again: Time for flowers to bloom and audio manufacturers to update their consumer product lines (A/V products intended for the custom-install market are typically announced in the fall, around CEDIA). 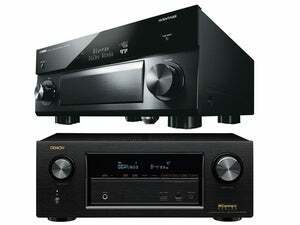 Marantz and Pioneer are keeping that tradition alive with new network receivers. 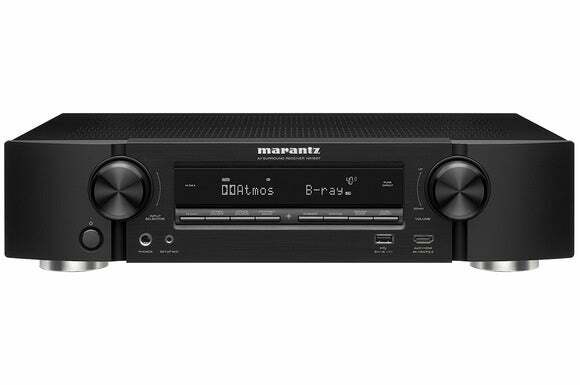 The Marantz Slim Design NR1607 looks more like a Blu-ray player than a full-blown A/V receiver. Meausring less than four inches high, it's designed for space-constrained home-theater enthusiasts who don’t want to give up any performance. One of the ways it achieves its low profile is to keep analog connections to a bare minimum. 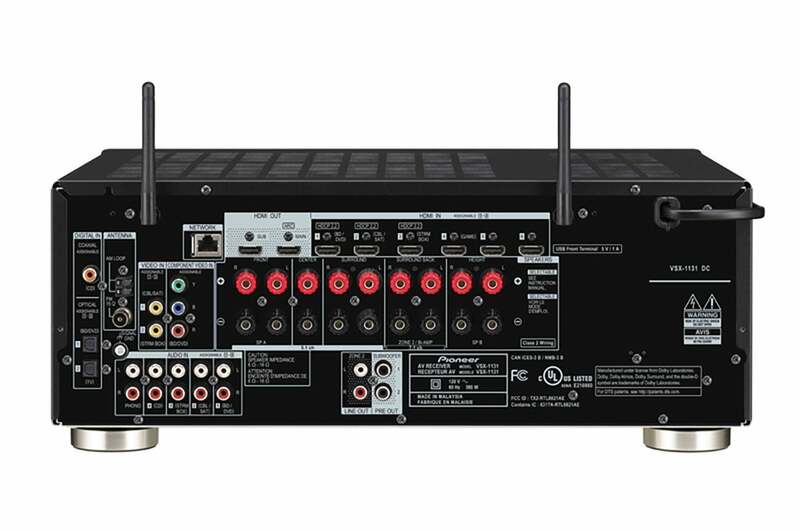 This 7.2-channel network A/V receiver features high-current discrete power amplifiers on all seven channels. The NR1607 is rated to deliver 50 watts per channel (8-ohm load) from 20Hz to 20kHz with 0.08% THD. We always caution readers to take manufacturer power specs with a grain of salt. They are rarely done with all channels driven, and the press materials don't disclose that information. A rear view of the Marantz NR1607 Slim Design Network A/V Receiver. Dolby Atmos (up to 5.1.2 channels) surround decoding is standard. A future firmware update (expected in September 2016) will allow the NR1607 to also decode DTS:X soundtracks. High-res audio playback and streaming, including support for AIFF, ALAC, DSD, FLAC, and WAV files, is also standard. The NR1607 doesn’t shortchange on the video front: Its video section has HDMI 2.0a and HDCP 2.2 (needed to play 4K Ultra HD copy-protected content) on all eight HDMI inputs (including the one on the front). All HDMI inputs support 4K Ultra HD video at 60Hz, with 4:4:4 Pure Color sub-sampling, High Dynamic Range (HDR), Wide Color Gamut compatibility, 21:9 video, 3D and BT.2020 pass through. 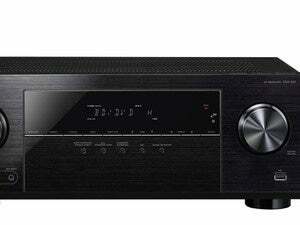 The receiver will upscale any analog or digital source to 4K Ultra HD. For a $699 MSRP, it’s pleasantly surprising to see that the NR1607 is ISF (Imaging Science Foundation) certified, with a full suite of video calibration controls along with ISF Day/Night video modes. What's not surprising is that the NR1607 can connect to your home dual-band Wi-Fi network. There's an onboard Bluetooth adapter, too. Once connected, you have a host of streaming choices at your fingertips including AirPlay, network-attached storage devices (NAS), Internet Radio, Pandora, SiriusXM, and Spotify Connect. 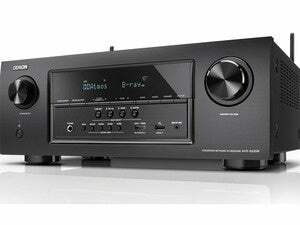 Marantz expects to deliver the NR1607 in May. 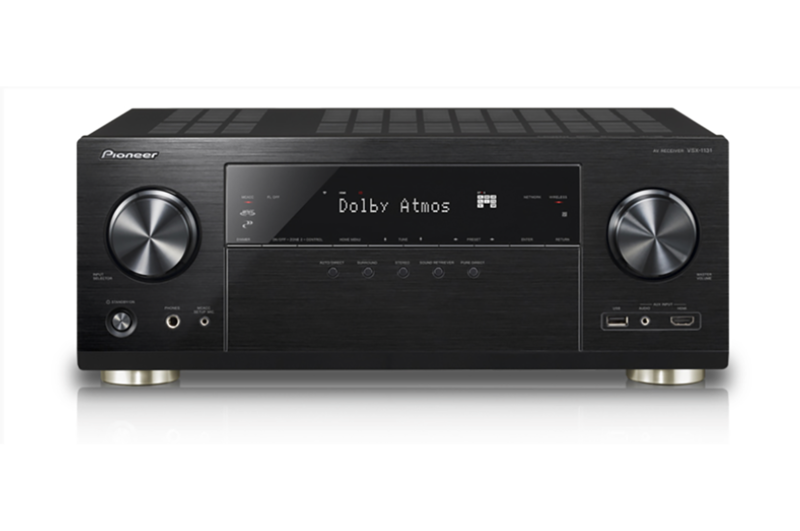 Pioneer announced a pair of mid-range network A/V receivers: The $600 VSX-1131 and the $450 VSX-831 each have seven HDMI inputs that support 4K video, HDR (high dynamic range), BT.2020 wide color gamut, and HDCP 2.2 copy-protection. 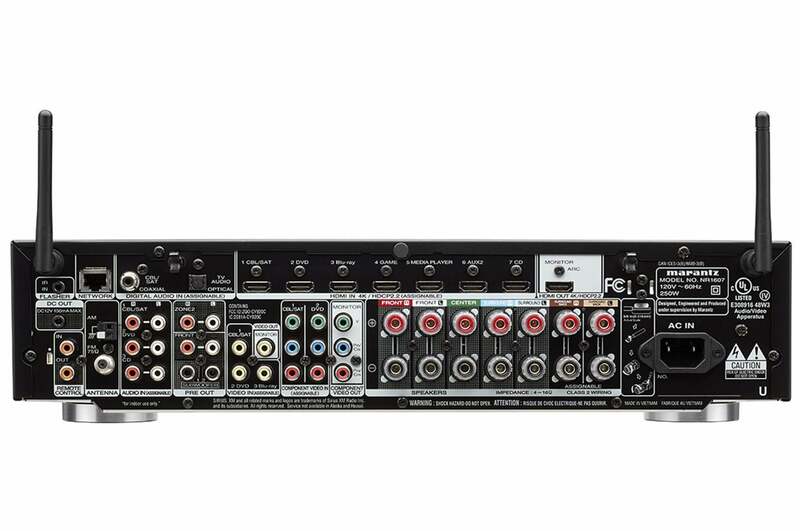 Oddly, Pioneer never explicitly states that these are HDMI 2.0a inputs. 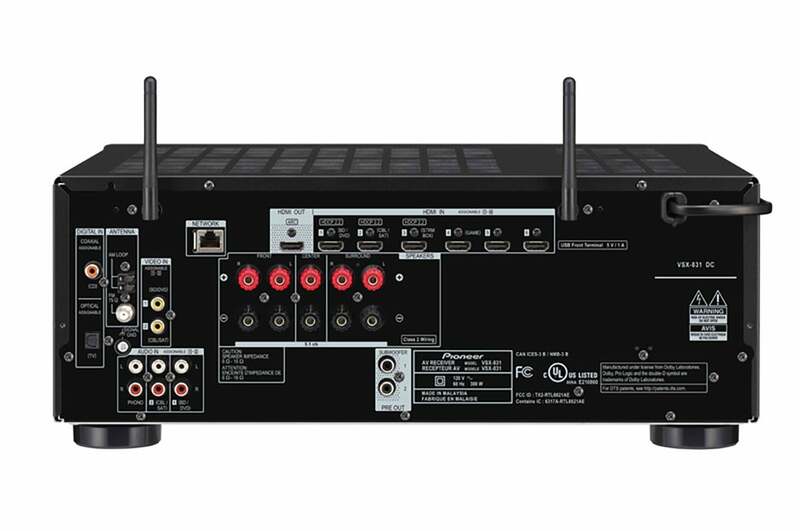 Pioneer’s VSX 1130 network receiver. You can add either model to your network (wired or Wi-Fi), and both also support Bluetooth and Apple's AirPlay technology. A future firmware update will deliver Google Cast and FireConnect support. The latter protocol mirrors any audio source connected to the compatible receiver—from vinyl to streaming audio—to FireConnect speakers in other rooms. The receivers support Pandora and Spotify today, and Pionner plans to add support for Tidal, Deezer, and TuneIn down the road. Pioneer’s Multi-Channel Acoustic Calibration System (MCACC) room correction is likewise standard on both. Rear view of the Pioneer VSX-831. In contrast to the VSX-1131, connectivity options are bare minimum. The VSX-831 is 5.2-channel receiver delivering 140 watts per channel, while the VSX-1131 is a 7.2-channel receiver rated at 170 watts per channel (here again, no indication as to how many channels are driven to achieve those numers). Beyond the added power and channels, the VSX-1131 also adds a second HDMI output and a powered Zone 2. Dolby Atmos (5.2.1 channels) is standard, with DTS:X support coming as firmware update scheduled for this fall. The VSX-1131 supports high-res audio with support for the AIFF, ALAC, DSD (2.8- and 5.6MHz), FLAC, and WAV codecs at up to 24-bit resolution and sampling rates up to 192kHz. Rear View of the Pioneer VSX-1131. 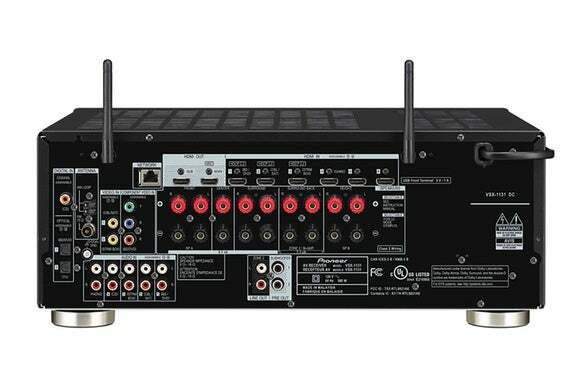 We're seeing trickle-down economics at work here: Features like network connectivity, immersive audio, and 4K UHD support were once available only in the highest-end A/V receivers. Now they're making their way into budget and mid-priced components. It's a very good trend.